Wow, December!! We're gearing up for our best attended meeting of the year! Our Christmas Trade Show and Social! Guests are welcomed at the member cost of $15+hst which includes your meeting and light lunch. Vendor tables are available to WiN Members for $10 (which will then be donated to a local charity). If you're not a member yet, this is a great month to join!! Please be advised that you must bring your own table. If you are interested in attending please connect by email at joinus@womeninnetworking.ca. I look forward to celebrating the holidays with you!! Happy summer in September!! Just a quick reminder that our October WiN meeting is coming up Thursday, October 5th. 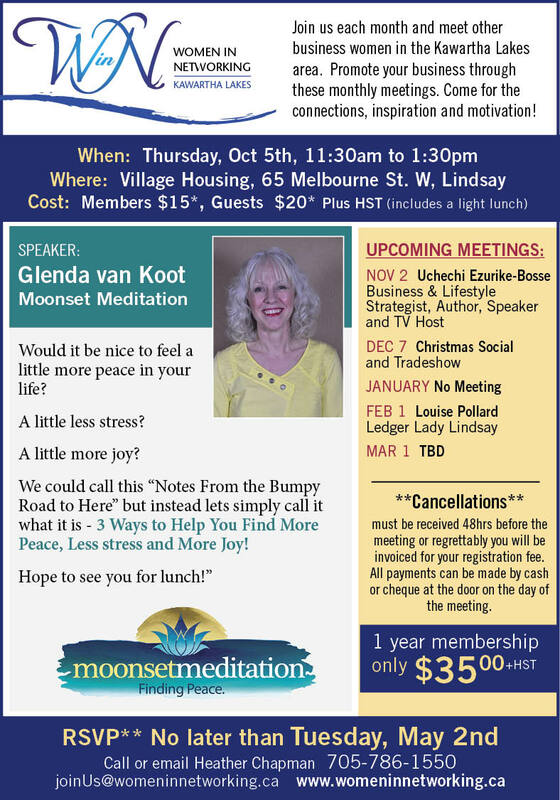 Our guest speaker will be Glenda van Koot of Moonset Meditation, see flyer below for full details. Please let me know if you are planning to attend by emailing joinus@womeninnetworking.ca. I am excited to say that we have a new caterer (thank you Glenda for you referral)! And… I look forward to seeing everyone! Happy September! Now that we’re all back into routine again it almost feels like the start of a new year. So let’s kick it in to full gear! Our speaker will be Manju Asdhir of Kawartha Care and Wellness. Please let me know if you are planning to attend. Thank you to those who have already replied and be sure your name is on the list below if you have already registered. A quick reminder that our August WiN meeting is this Thursday. Remember to mark you calendar for the first Thursday of each month so you don't miss a meeting! Our guest speaker is Sharon Summers. She has recently completed a course on working with seniors and has a lot of interesting information to share. Many of us work with seniors in our businesses and care for seniors within our families. I look forward to seeing everyone! Please let me know if you are planning to attend by sending an email to: joinus@womeninnetworking.ca. A quick reminder to RSVP for this Thursday’s WiN meeting by emailing joinus@womeninnetworking.ca. Rebecca Foster, Massage Therapist, of Kawartha Care and Wellness will be our guest speaker. Full details below. Just a quick reminder that our April WiN meeting is scheduled for Thursday, April 6th. 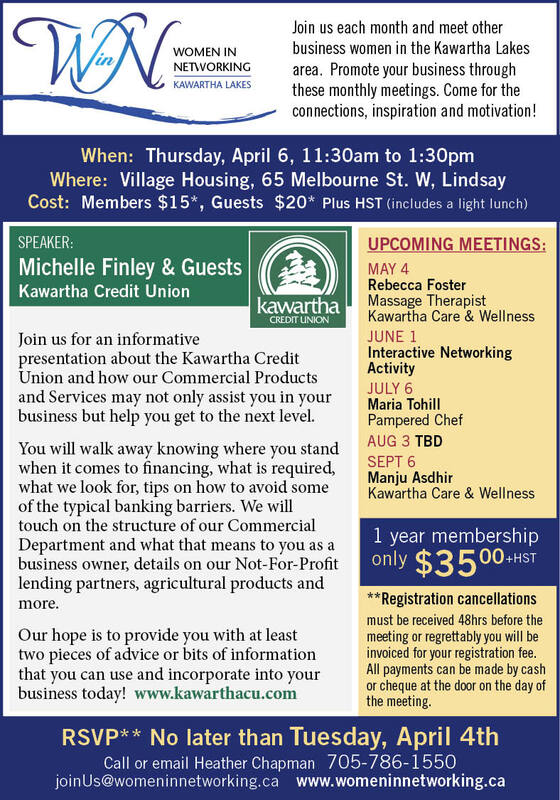 Our guest speaker will be Michelle Finley and guests from the Kawartha Credit Union. Full details below. 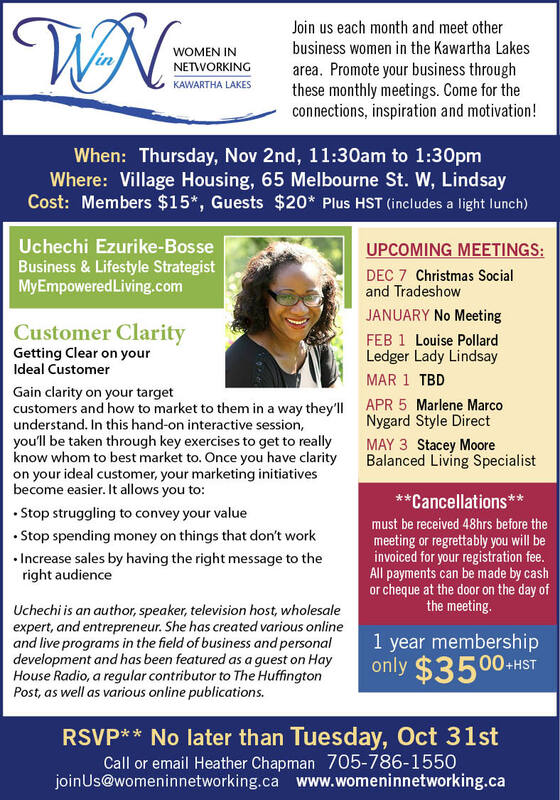 Please let me know if you are planning to attend by emailing joinus@womeninnetworking.ca. Our March WiN meeting will be taking place Thursday, March 2nd. Motivational speaker, Monique Howat, will be our guest speaker, you don’t want to miss her entertaining and interactive presentation! Full details below. Please let me know by email if you are planning to attend. It time! Time to kick-start 2017! 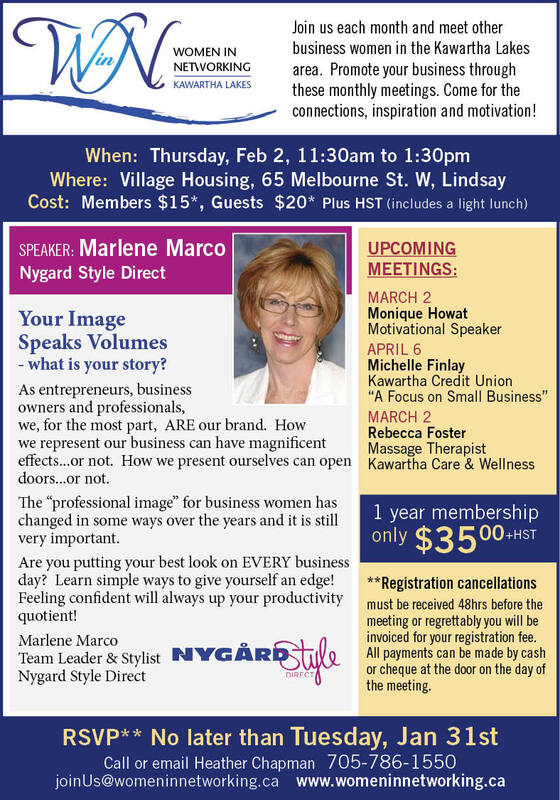 Marlene Marco, Nygard Stylist, will be our guest speaker at our February WiN meeting. Marlene will talk about “Your Image" and how it relates to your story, your brand and ultimately your business. Marlene has been an entrepreneur for close to three decades. She has a diverse background in independent business and one of the great joys in Marlene’s career is mentoring and supporting others to success. Please email joinus@womeninnetworking.ca to register.